The world has seen an “unprecedented” surge in the production of new synthetic drugs, according to a report released [this week] by the United Nations Office on Drugs and Crime (UNODC). In its latest Global Synthetic Drugs Assessment, the agency says it identified 348 new synthetic drugs in 94 countries as of last year, with the majority emerging between 2008 and 2013. The UNODC received reports on 97 new synthetic drugs in 2013 alone, though it acknowledges that the true number of substances on the market could be much higher. 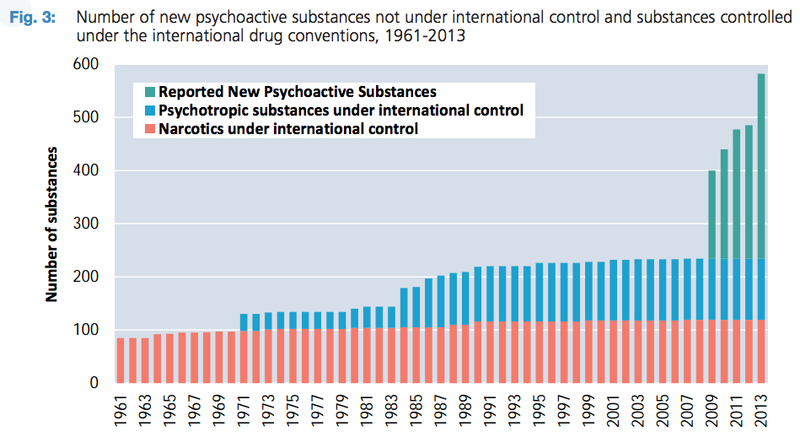 The agency defines new psychoactive substances as drugs that are not controlled under international conventions, but may pose public health risks. Synthetic cannabinoids — drugs designed to mimic the psychoactive effects of cannabis — comprised the majority (28 percent) of such substances reported to the UNODC between 2008 and 2013, followed by synthetic cathinones, including bath salts, at 25 percent. In March 2011, the U.S. Department of Justice placed the five most widely abused synthetic cannabinoids—including Huffman and Pfizer’s—on its Schedule 1 List of banned substances. As [Dallas ABC station WFAA] explains, “K2 is difficult to regulate because manufacturers switch up the ingredients frequently.” And why do they do that? To stay ahead of the law. The upshot is that a relatively benign ingredient may be replaced on the sly with something less fun or more toxic. And as the DEA implicitly admits, legal restrictions on marijuana—a well-researched drug that humans have been consuming for thousands of years, a drug that the president of the United States correctly calls safer than alcohol—are encouraging people to experiment with novel chemicals that may prove far more dangerous.